Alibaba, Disney, AT&T and Starbucks make your heart go pitter-patter. They are some of the most looked up stocks on CNNMoney. Apple (AAPL), FedEx (FDX) and Southwest (LUV) were some of the stocks that CNNMoney picked as its favorites. But what stocks do readers love? We took a look at some of the most searched tickers on the site. 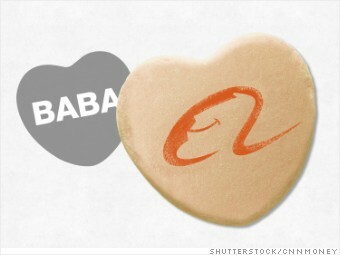 Investors are gaga for BABA. Alibaba (BABA), the giant Chinese e-commerce company, went public in September and immediately became one of the most popular stocks to track. It makes sense. The stock surged on its first day of trading and was the biggest IPO of all time. Even though the stock has pulled back lately due to concerns about earnings growth, Alibaba is still worth more than Facebook (FB), eBay (EBAY) and Amazon (AMZN).